You’ve taken the time and installed new kitchen backsplash tile. Congratulations! You’ve done yourself a favor to help protect your walls and to improve the value of your home. However, instead of all the grease and gunk building up on the walls from your delicious cooking, now it will end up on the backsplash tile. That’s okay! Here are some simple steps to try to keep your kitchen backsplash looking like new. 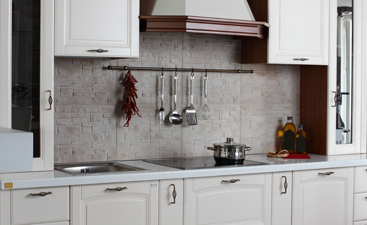 The most common choice for a kitchen backsplash is tile. 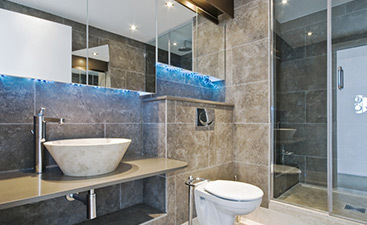 With the wide variety and affordability of the material it’s no surprise. When your backsplash tile starts to get dirty, there are two different ways to clean it up. The first is a gentle way where you mix one part white vinegar to one part water and apply it to the backsplash tile. Let it sit a little while before wiping the surface down with a soft cloth or sponge. If this mild method doesn’t work, take it up a notch and try an all-purpose cleaner. Allow that to soak and then wipe clean again. If you have opted for a slate or marble backsplash, you’re in for a little more work than if the backsplash was tile. 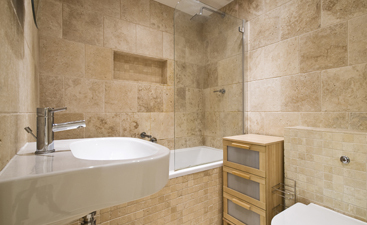 Both slate and marble are porous materials that will absorb any grease left on it into the outer layer. Grab an old toothbrush and get to work scrubbing the backsplash with some warm water and mild dish soap. Try to be gentle when doing this but make sure you’re thoroughly cleaning the surfaces. Make sure to rinse well when you’re finished scrubbing. If your backsplash tile simply won’t come clean with a little bit of cleaner, go ahead and grab some Goo Begone to get rid of all that extra grease.